This time last year we were dealing with the news that there was nothing else that could be done to fight Joe's cancer. It was heartbreaking news, as my blog post from that day was titled. As the calendar flipped to December today, I felt a range of emotions, most of which I was expecting. I just wasn't quite expecting the intensity. With the dreaded anniversary quickly approaching and Christmas and New Years following close behind, it was almost as if the December 1st date change were magic with the way that it pulled my heart in a million directions. Today, I started my Christmas decorating. This afternoon my mom came over and helped me organize Domani's room and then bring the Christmas things down from the attic. Up until last year, Joe and I would always tag team this - he going up into the attic and I taking the boxes and bins from him at the bottom of the ladder. Last year for the first time our routine changed and I found myself poking my head in the attic along with my Dad. This year, I was up in the attic and my Mom was receiving the boxes and bins. Going in the attic is emotional for me now because it was Joe's job, so I'm especially thankful to have had the help. Tonight I put up the little tree in our living room. It was Joe's from when he was a bachelor. His Mom had gotten it for him because she thought he should have a Christmas tree. She was right. 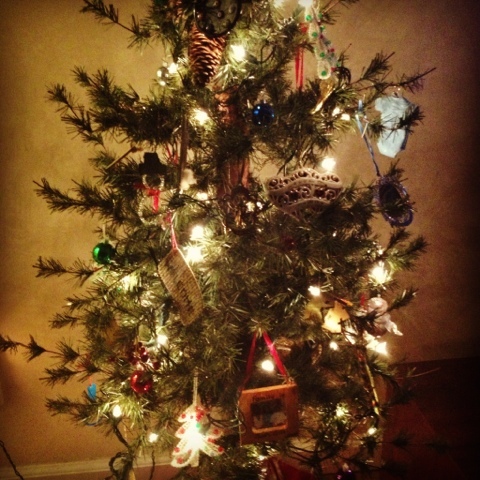 It was the perfect "Joe" tree and every year I loved helping him decorate it. Last year, we put it up right after Thanksgiving and I'm glad we did. It was a comfort to me to have it there as Joe's condition worsened and I'm not sure I could have handled putting it up after he passed. We keep many of our most sentimental ornaments on that tree, including ones from our travels so the tree is a reminder of our many happy moments together. Not surprisingly, I shed a few tears as I was trimming the tree tonight, especially with each "Joe & Anne" ornament I came across. I was surprised, though, at how sweet it was to also look at the tree and recall how it looked in his apartment in Cranbury the night we got engaged or to put up the Henry the VIII ornament and remember our amazing trip to London and the Gutter Twins concert that went with it. While there is still a lot of sad and lonely, I am starting to think about those amazing times when I think about Joe. I am starting to think first about our incredibly special love and second about how much I miss it. I guess that's progress. It is late and we are all quite tired in the Deak household. After a long night last night which included a visit from the hospice nurse, we went to Joe's oncologist today. Joe had been scheduled for his next chemo treatment, but given his weakened state it was hard to believe they would do it. That proved correct but on top of that we were told by the doctor covering for Joe's regular oncologist that no further treatments would be possible. A punch in the gut. And she wasn't particularly helpful or sympathetic. Another punch in the gut. We got a visit from his hospice nurse and later a call from his regular oncologist. His oncologist's heartbreaking conclusion was still the same but it was helpful to have our questions answered and to hear the details about his reasoning. The honest truth is that it was very difficult for Joe to travel to Basking Ridge today. His weakened state makes even a walk from the living room to the bedroom a difficult task, let alone walking around to get ready and then out to the car. It would just be too much for him to continue going through the motions of treatments which aren't really having an impact on the cancer. We will receive some additional services from hospice and are still considering any other possible options for Joe. Please pray for wisdom in how to proceed and for peace during this seemingly impossible time. As difficult as today was, it was nice to come home to a freshly cleaned house and some yummy food in the fridge. We have the most amazing support network and I have a suspicion it will only get better. Love to you all! I so vividly remember bringing that tree over to Joe's new place. It was, I believe, the first apartment he snagged in Princeton. When Ross and I carried the tree in, complete with sets of lights and decorations, Joe gave us a typical Joe look. I think if I could have captioned the look, it might have read "Ma...why do I need that?" I like to believe, though, he was secretly smiling and quite thrilled. I know that you were the one to strongly encourage him each year after that to put up that tree. I too, am thinking about that most difficult day when it was time to make the decision to stop treatment. My emotions are raw and tender when I think of those last days. And as old memories are savored, new ones are made. Perhaps one day, Domani will have that tree in his first apartment.